Timberland knows how to make a statement. The heritage boot brand this week will host a series of activations around New York City aimed at encouraging people to get outdoors and enjoy - as well as preserve - nature. 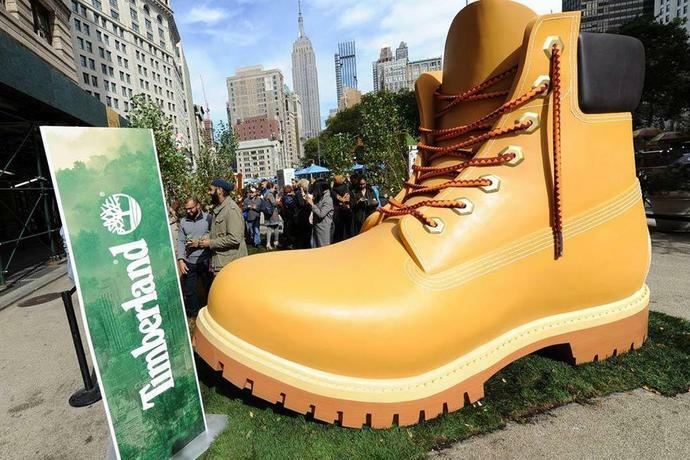 The festivities kicked off today with Timberland dropping a 13-foot replica of its iconic yellow work boot in the middle of the city's Flatiron District - atop a pop-up park with grass, benches and a full-sized living birch tree. The ginormous boot, of course, served to grab the attention of scores of passers by who were then encouraged to plant a tree and make a pledge that would benefit the environment. "We have a long history of doing good in the community and making better products but I don't know if we've bringing it to life or being very consumer-facing about it over the past few years - we've actually been very quiet about it," said Kate Kibler, VP of direct to consumer and Americas Marketing at Timberland. "What we're doing today is working to build a movement toward our purpose and toward greener communities." To that end, tomorrow, 150 volunteers from Timberland, Journeys and the Student Conservation Association will join forces to beautify the grounds and restore the student greenhouse above the Manhattan Center for Science and Mathematics in Harlem. And on Thursday, the brand will host the grand opening of its 5th Avenue pop-up store, which has a range of features that give a nod to sustainability and environmental consciousness. "There's a lot of greenery we're bringing into the store for the people of New York," Kibler said. "There's a living wall and a larger-than-life ficus tree. You'll also see event activations in the store - like a rain room, which is meant to be a fun experience to bring you back to the root of Timberland, which will protect you in foul weather. We also have a snow room area with the same kind of intent - a very Instagram-able moment." The experiential components of the store, according to Kibler, also show the brand evolving its brick-and-mortar strategy at a critical time for footwear and fashion players - many of which were challenged at the height of the digital shift. "Digital is incredibly important [but] brick and mortar is not going away," said Kibler. "You hear a lot about the retail apocalypse - and yes, there are retailers that are going away - but this is to leave space for new and inventive retailers to come along and give experience to consumers." Kibler said Timberland will be keeping a close watch on the 5th Avenue pop-up - which run until January - for key learnings that it can apply to new store launches. "People still want to come in and touch and feel the product," Kibler said. "They want to [engage with] our store teams and try things on. That human element and physical, three-dimensional tactile piece of it becomes really important - retail got away from that over the past 50 years and became about just selling the product and selling a lot of it. Now, it's about connecting with the consumer and having them connect with the brand."